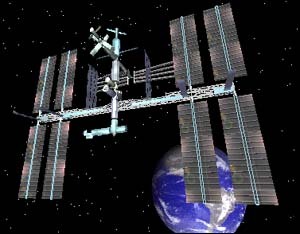 The International Space Station, which begins space assembly in June 1998, is the largest scientific cooperative program in history. CNN Interactive presents a sneak preview of the completed station with this VRML (Virtual Reality Modeling Language) model. You can twist and turn the craft and click on hot spots to learn about the individual components. Also, check out "spacewalk" under the viewpoints menu to get a human perspecive on the Station.